Bright sunlight filtered through the intricate stained glass of the Hall’s windows. The cold stone brick walls and floor of the room soaked in the warm illumination. Around the Hall, courtiers stood in small, casual groups, talking of politics and court gossip. Suddenly the great wooden doors at the end of the Hall burst open. A fully-armored knight strode in; the king jumped excitedly to his feet. Breathing heavily from this exhortation, the knight gazed about the room, his grim countenance silencing the many whispering groups of excited courtiers. The crow-shaped crest atop his helmet bobbed up and down with each breath; it almost seemed alive and ready to fly away. The excitement in the court couldn’t be held in any longer. Wild whispers rose to shouts as the courtiers suddenly realized the gravity of this proclamation. 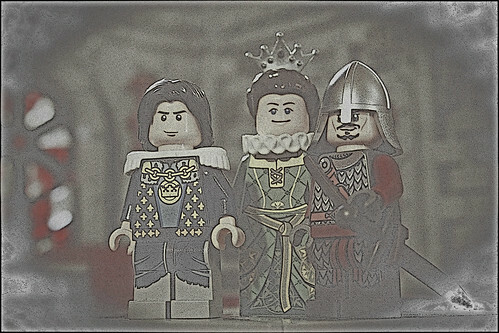 The war was no longer just a distant rumble; it had now grown to a mighty roar! Wow! Beautiful. If I had the pieces for it, I'd try to use your technique to build the throne room of Minas Tirith. Nice work. Do you have more detailled pictures? I can't believe this is getting only 4 replies (well, 5 including mine). It is so beautifully made! I was also wondering why this doesn't get any comments. It is a splendid throne room (something I've wanted to build for a long time, so this will surely be of inspiration for me). I love the mat on the floor and the floor patterns. 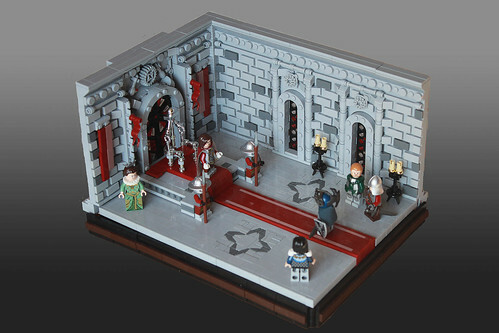 The walls and the windows are great :) I'd like a close up on the throne, though! I'd like to see close up too! Follow the trail to Flickr and you can see the pic in bigger size, like 1600 x 1067. Interesting details! Good work love how you did the carpet! Great. Just splendid. Thanks - I checked out the pic "embiggened" and was not disappointed. Tons of great details, some so simple they blow my mind in that I've never seen them. Very fresh masonry and brickwork. And solid "copy" to go with the solid build. I can feel the deliberate crafting of each. Great work Digger. Still waiting to see you in GoH!! Well worth looking at the more detailed pictures for this....there are loads of really great techniques and inspired parts usage. Thanks guys! Sorry about the lack of detail picks...I'm planning on doing another throne room soon, so i might use some of these techniques again. Hopefully you'll be able to see them better there. This really is a fascinating piece. Gives me some great ideas, truly. love it, can you do a close-up on the trone? Great build, love the details!